The second in this series of split CD releases on Boltfish Recordings, showcasing tracks from two like-minded artists. This edition presents Damien Shingleton and Lum. * Art park swing contains samples from 'swing park art' by A Simple Storm. "Another new signing for Boltfish that goes by the name: Damien Shingleton. (Well that’s not entirely true, because he was featured on the "Patchwork" double disc release (DEC 2005) and contributed a remix of Cheju’s "Camellia".) On what is a new series of split releases aptly entitled "The Tandem Series". The concept is simple enough two artists co-habiting the same release. Damien Shingleton starts off with a very strong track entitled "Agra", engineered static, an untreated piano in solitude, flat bassline and beautiful melody creates a hypnotic track with deep reaching bass and original arrangements and venture in to what is almost a patent of Adim’s (Autres Directions In Music) Melodium - guitar based gentle quirkiness in "2 For Joy" bass is thick though. "Art Park Swing" got some treated vocals and simmers along with some reversed guitar action added to the ensemble and a shy four to the floor beat lingering in the background. "Static" is a very short outro containing: static. The other artist contributing to this split is Lum, far from being a stranger in Boltfish contexts and proud record label owner at that. Lum’s first offering is "Miel-Volm" and the characteristic crisp sound production that is a Lum trademark is as audible in this work as it ever was. A virtually beatless track formed by a collection of synthesised sounds makes up this track - a lot of space in this one (in the literal meaning). "Darko" is not only the latter part of a film title (and an exceptionally good 21th century American film at that) it is also the title of Lum’s second contribution, once more leaving the beats at the door and focusing on individual sounds to form musical form. "Cefone" is also deprived of beats and does feature some expertly treated synthesised sounds and vast use of space in the production is effective – contemporary electronic music demonstrated. "Xec 4" ends Lum’s latest contribution to Boltfish, washes of (analogue?) synthesised sounds that would fit the generic description "Sci-Fi" prolong themselves into the void of space. It’s simply masterful "less is more" music and yes it is cold and you are completely alone!" "The second in Boltfish's series of Tandem releases is another edifying experience and one where even the two artists featured seem to assume different identities within their own tracks. First up is Damien Shingleton, a former DJ and keen traveller. This worldly experience is put to good effect as he devotes time to piano, clipped beats and - on the rather fine '2 For Joy' - the folktronica sound employed by the likes of Four Tet. On first hearing, Lum appears to be a fellow who appreciates the more overtly melodic world of techno but by the end of the sinister 'Xec 4' it's clear that this self-proclaimed "twisted obsessive" has more evil thoughts on his mind. Two more artists, then, with their own ideas on subverting electronica." 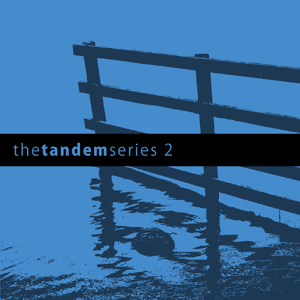 "The Tandem series 2 takes a different path from series 1. This release has more secrets and unseen doors to open, with the use of minimal, questioning and thought inducing sounds which keep you on your toes and looking over your shoulder throughout. Damien Shingleton and Lum do the Boltfish camp proud."